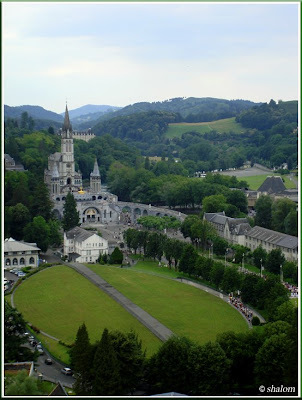 The Sanctuary of our Lady of Lourdes: the building rising up at the back is the Rosary Basilica, while the large oval lawn in front conceals the Basilica of St. Pius X, the world's largest underground church. Very interesting, I didn't know what it looked like! Yeah, we just thought it was a massive lawn at first, only when we saw the entrance to the church we realised that it was its roof!